I need to find a placement for my relative, how do I do this? Are all Columbia Aged Care facilities accredited? What are the fees for accommodation? What do these fees and charges include? Can I bring in some personal belongings? Can my family participate in the various activities in the facility? Can I take part in the decision making in the facility? 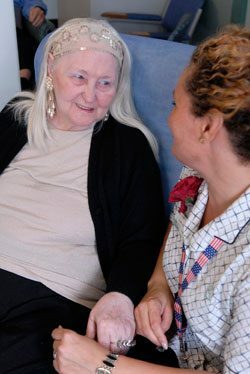 Prior to entering an aged care facility you will need a current assessment by the Aged Care Assessment Team (ACATs). These are normally based at a hospital or community centre. The role of the ACAT is to assess your needs and determine what type of care may be best for you. If you are eligible for residential aged care contact the Director of Nursing at the Columbia Centre most convenient to you. Arrangements will be made for you to visit the centre and to answer any of your questions. An extensive Resident Information Package is available to you prior to admission. Yes, all our facilities have three-year accreditation – you can read their reports on www.accreditation.org.au. All Commonwealth subsidised facilities must be accredited to receive funding. Fees and charges are calculated and regulated by the Commonwealth Government. Fees consist of a basic daily fee, a daily income tested fee (if applicable) and a daily accommodation charge (depending on your assets). The fee structure will be fully explained to you prior to admission and the current fee schedule is included in our Resident Information Package. The fees include accommodation, nursing care by qualified staff, assistance with all activities of daily living, extensive therapy programs and all hotel services eg food, cleaning, laundry and maintenance services. They also cover things such as a range of toiletry items, mobility aids, continence aids, baseline medical supplies, access to physiotherapy, dietician etc. The fees do not include personal items of choice such as clothing, hairdressing, newspapers, telephone, pharmacy items that are specifically ordered for you. All inclusions and exclusions are listed in the Resident Handbook. We encourage you to bring in items to decorate your bedroom such as pictures, photos or a small piece of furniture. Often rooms are suitable for a small table or chest of drawers. We are happy to accommodate this when possible. For the health and safety of all our residents and staff, other items such as beds and chairs must meet regulations. Just ask and we are happy to discuss options with you. We are more than happy to have family take part in any activity, outing or function that is taking place. We also encourage relatives to take part in any decision making processes, should you so wish. It is important to note that the facility is your home and we endeavour to ensure that the environment is conducive to a home like atmosphere. Contact with your family and friends is very important to you and to us in fostering that atmosphere. Your feedback is very important to us and there are several options you can take to give us your ideas, comments or complaints. There is a Resident / Relative Committee that meets quarterly to discuss all current activities and plans for the home and this is a good venue to take an active part in the decision making process. We also have an Improvement Log system, which can be used at any time to give us your feedback.